I love Italy, and urban history, and who doesn’t love a good foundation legend? That being the case, these papers, hosted by the Italian Art Society, were right up my alley in terms of sessions to hit at KZOO a few weeks ago. The 3 papers featured here looked at the development of the civic identities of Florence, Genoa and Rome through art, architecture and foundation legends. What are foundation legends? They’re stories of the origins of a city or nation, and often harken back to Ancient Greece, or Rome. They often tie in with a supernatural deity, a royal personage or local hero who embodies the beliefs and ideals of the community to which they belong. Foundation myths also serve to cement the righteousness of past histories and highlight glories to cast the city in its best possible light. In the Middle Ages, Italy was enamoured with the idea of its cities being tied to a Roman or Greek past. Catherine R. Carver, who is currently working on a book entitled Urban Piety, spoke to us about Rome with a focus on the medieval basilica, in A City Divided: Geographic Hierarchy and Civic Identity in Late Medieval Rome. Scholars of Rome’s medieval monuments are aware of the city’s civic identity. Medieval foundation narratives were grounded in Ancient Rome, and tied to spatial allegiance and identification. 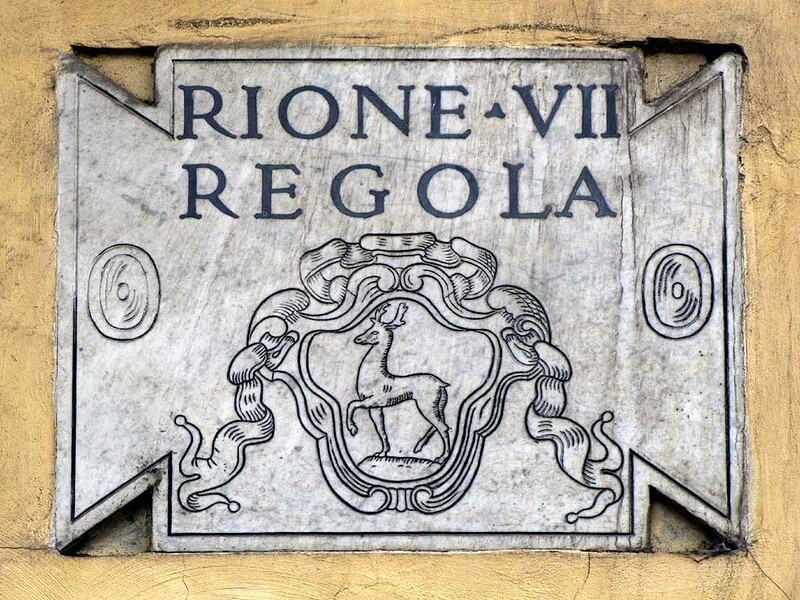 The ubiquitous plaque marking the Rione VIII is a familiar site to all visitors of Rome. What is a ‘Rione’? Riones are the old administrative divisions of Rome. These divisions dated to ancient times, when the city was divided into regiones, ‘riones’ in Italian. The Emperor Augustus (63 BC – 14 AD) created 14 regiones in Rome. Markers form clearly defined boundaries; which suggests a logical overlay and geographic order to the city. Modern architectural lines in new buildings paid homage to Rome’s Augustan past. Even more modern leaders have tried to align themselves with this glorious Roman past, like Mussolini, who often mimicked an Augustan stance to remind people of his links with their Roman past. The legacy of antiquity features highly in the Roman civic identity. There were approximately 178 Ecclesiastical establishments in Rome during the Middle Ages. The rione system continuously evolved during this period. In the beginning, the boundaries and borders of Rione were unclear, as witnessed by various lawsuits. The 12th century saw a return to more structured divisions again and 12 started being used unofficially. There was a rapid increase in Rome’s population in the 11th and 12th centuries as there was a rise in trade, and an influx of merchants who built their own parish churches and monuments. The Rione in the 13th century were subdivided into smaller units, like mini neighbourhoods, however, rione boundaries weren’t firmly established until the 18th century, around 1748. After that point, the city assigned numbers to all of Rome’s churches and catalogued them by Rione. For the past 4 years, Carver has been working with the University of Michigan to map the churches in Rome. Their findings have changed the conception of how people need to understand medieval Rome. A parishioner’s relationship to his or her church was the most telling marker of where he or she belonged. Carver demonstrated the changes churches went through with the Church of San Salvatore, and how they were modernised while retaining their historical roots. This church has been around since the 12th century. It is listed as #825 on an 18th century map of the city has apartments added to it, and an urban patio at the top of its campanile (bell tower). It has kept its medieval features while incorporating modern ones. Roman civic identity is now being re-evaluated. This transformation of identity in Rome was not a linear path. There was tension between parish church, and rione for many years. From Rome, we move to a city near and dear to my heart: Florence. In The Ponte Vecchio in Giovanni Villani’s History of Florence, Theresa Flanigan (College of Saint Rose), who has published many articles on the Ponte Vecchio, spoke about the history of this famous bridge. The oldest bridge spanning Florence is the Ponte Vecchio, meaning literally “old bridge”. The current Ponte Vecchio was built between 1339-1345 after a devastating flood destroyed the first bridge. Florentine Chronicler, Giovanni Villani (1280-1348), records in his Nuova Cronica that the bridge was first built in the 9th century, in 801, by Charlemagne. However, there is no proof of this foundation legend. Scholars consider this a complete fabrication by Villani. It is also refuted by archaeological evidence. He intentionally manipulated the foundation narrative in an attempt to craft a Carolingian re-foundation of Florence. The Ponte Vecchio’s significance in Villani’s narrative includes the Roman colony under Julius Caesar in 70BC. The colony celebrated their victory over the Fiesolans by building a temple and sculpture to the God Mars. This lost Mars figure features prominently in Villani’s narrative. Mars stood on a pillar in Florence until the 4th century when it was rededicated to Saint John the Baptist and is the current location of the Baptistry today. The well being of Florence, according to Villani, was directly linked to the location of the statue of Mars. Its removal in the 4th century precipitated Florence’s destruction by Totila, King of the Ostrogoths (d. 552). Villani dates Florence’s renewal to April, 801, claiming Charlemage had Florence built on a model of Rome and was a renewed city under Charlemagne’s guidance. This narrative is further discredited by a number of Byzantine churches in the 6th century. Moreover, there is evidence of 6th and 7th century walls coming well before the Carolingian walls mentioned in his history of Florence. There are 3 Lombard churches south of the Arno river from the 7th – 8th centuries, showing that the city was not dormant as suggested by Villani’s narrative. So why did he fabricate a Carolingian refoundation legend? He intentionally did this to support his political affiliation with the Guelfs party, and the Papacy, opponents of the Ghibellines. This schism began at the end of the Carolingian rule with the murder of Buondelmonte. The 1333 flood was portrayed by Villani as a Scourge of God. The murder at the bridge along with the loss of the war God Mars, was, in Villani’s viewpoint, due to Italian factionalism. The bridge was a symbol of misfortune. Although the Florentines are Christian, they still have superstitions around pagan idols, the connection to Rome and connection to Paganism. Villani’s last entry was dated July 18, 1345. Finally, we move onto Genoa, in George L. Gorse’s, Janus, John the Baptist and Neptune: Foundation Myths in Medieval and Renaissance Genoa, which examines the Medieval foundation myth under the Greek God, Janus, protector of portals. This paper focused on work around the Cathedral of San Lorenzo from the 11th-14th century and other aspects of Pagan myth intermixed with civic and Christian ideals. The church was founded in the Early Middles Ages, around the 5th century. It was engulfed in a disastrous fire in 1296 as a result of factional family violence, which was common in Genoa, between the rival Guelfs and Ghibellines. The cathedral was rebuilt with the Janus/St.John the Baptist theme. Slightly later, frescos depicting the Janus temple of peace were created to the north of the cathedral – Stanza dei Mesi (Canon’s Cloister). These frescos were discovered between 1986-1991. June 24th is Feast Day in Genoa, where a procession occurs and the Archbishop blesses the sea. This act stemmed from a Pagan civic religious foundation myth mash up with John the Baptist. Janus and Giovanni (John) eventually became one in the legends. In 1517, Andreas Doria (1466-1560), famous Genoese naval Commander and Admiral, had the Cappella del Molo commissioned for the waterfront, which was dedicated to Saint John the Baptist in celebration of the victory over the Turks. In September 1528, Doria led his fleet against the French and Charles V, but later became Charles V’s close friend. He formed a new government free of foreign influence, but refused to take leadership as a Doge. For this Doria was named, in Augustan fashion, ‘liberator of Genoa’. He was processed to the Cathedral to offer devotion to the relics . In his will, Doria bequeathed his heart to the Cappella del Molo. However, this wish was never actually carried out and he was buried in San Matteo with his family. Doria identified his heart with the sea and with Genoa.